What happened: The Daniel Suarez and Stewart-Haas Racing marriage was finally made official Monday after a lengthy period of negotiation and speculation. Suarez lost his ride at Joe Gibbs Racing when Martin Truex Jr. moved to the 19 car following Furniture Row Racing’s shutdown. Meanwhile, SHR had an open seat in its No. 41 car after Kurt Busch and sponsor Monster left for Chip Ganassi Racing. It apparently took months to finalize the sponsorship details with Arris, but Suarez and SHR are now moving forward. 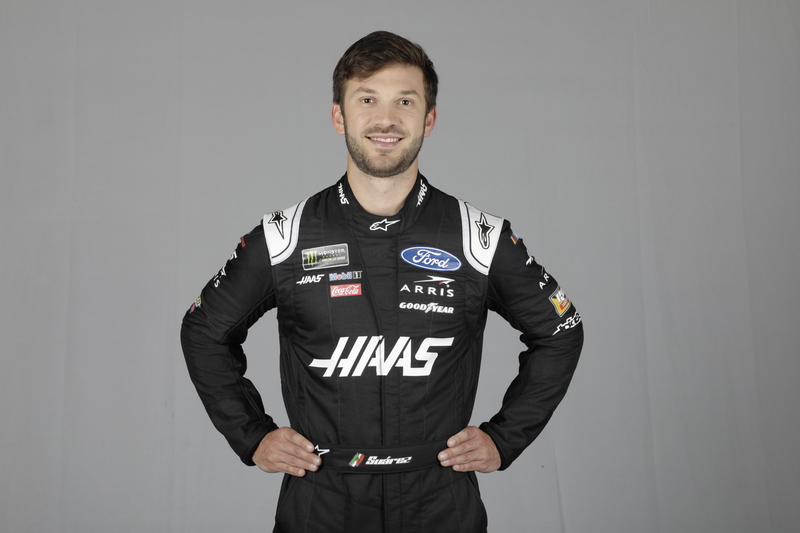 Haas Automation — the machine tools company of SHR co-owner Gene Haas — was listed as the sponsor ahead of Arris, and the photo distributed in the team’s news release has Suarez in a black Haas firesuit. What it means: A lot went on behind the scenes on the business side, from Arris leaving JGR to Suarez bringing enough sponsorship with him to get the ride. Gene Haas, who has most of the input on the No. 41 car, told NBC Sports in September about the possibility of signing Suarez: “We’ve talked to him. He brings a different group of sponsors. Like anything else, it comes down to the bottom line. How much sponsorship are we talking? How much money does SHR get? How much money does the driver get? Those are the kind of typical things that can take awhile to iron out because everybody wants everything.” Clearly, he wasn’t kidding about the “awhile” part, as it’s now less than six weeks until the Daytona 500. But that’s how business is done in NASCAR these days, as sponsorship is much more complex than companies just slapping their names on the hood. News value (scale of 1-10): Four. Being a ride with one of the top teams in NASCAR saves it from being lower. But everyone figured this was coming for soooo long that it’s not surprising — therefore the actual “news” part is lower than average. Three questions: Can Suarez really pull a Joey Logano and break through for wins after leaving JGR? Will Suarez finish higher or lower than Busch’s No. 1 car at Ganassi this season? Haas has said it takes $20 million to run a good Cup team without the driver salary included — so how much money were Suarez’s backers ultimately able to bring in order to secure the ride over other potential candidates? What happened: 5-hour Energy, one of the main sponsors for Martin Truex Jr. at Furniture Row Racing, announced it would be leaving the team — and the sport — at the end of this season in what it termed a “business decision.” 5-hour joined Truex’s No. 78 this year after being the full-season sponsor on Erik Jones’ No. 77 last year. Prior to that, 5-hour was linked with Clint Bowyer during his time at Michael Waltrip Racing and HScott Motorsports (2012-16). What it means: Even winning at a frequent rate doesn’t ensure continued sponsorship anymore. Truex is coming off a championship season and has been one of the “Big Three” drivers with four wins already this year. And yet, for whatever reason, 5-hour decided it was time to spend its marketing dollars somewhere other than NASCAR. That’s a discouraging sign, especially since Monster won’t be the Cup Series title sponsor for much longer and thus would have freed up 5-hour to go wherever it wanted. News value (scale of 1-10): Seven, for a combination of reasons. Truex is a big-name driver losing a big-name sponsor, for one. But it’s also newsworthy that yet another major sponsor is departing from NASCAR after spending a couple hundred million dollars in the sport over seven seasons at the Cup level. It’s yet another punch in the gut for those hoping NASCAR’s slide will end soon. Three questions: Can Furniture Row find a replacement, or will team owner Barney Visser have to put his company on the hood again? Does this end the speculation Furniture Row could re-expand to a second car next season? What does it mean for NASCAR when a company stops spending its money altogether instead of just staying involved at a reduced commitment level? What it means: A major development in the ongoing battle for NASCAR’s soul, which had sparked a debate over what was more important — pure competition or the quality of the show (you can find a timeline of this story here). While the All-Star package undoubtedly was entertaining, it raised questions about NASCAR becoming a drafting series if those rules were used in points races going forward. Drivers like Brad Keselowski and Kyle Busch had begun to speak out against the idea of using the package in more races, but NASCAR and the tracks — particularly the Speedway Motorsports Inc. venues headed by Marcus Smith — seemed intent on giving it a shot. Earlier this month, NASCAR’s Steve O’Donnell said the package could be used in three more Cup races this season before the playoffs began, and races like Kentucky, Pocono and Michigan seemed like potential candidates. But something must have happened behind the scenes with the various councils NASCAR consults with, because the All-Star package was suddenly snuffed just when its prospects started to burn brighter. News value (scale of 1-10): Seven, due to the surprise value. No one outside of NASCAR cares about rule packages or even knows what that means, but this had become a pretty important story inside the garage. The fact NASCAR won’t even try the package again in Cup until at least 2019 is a significant and puzzling development (albeit a good one for those who rejected the idea of seeing a restrictor-plate type race every week). Three questions: What changed? Whose voice or voices in this conversation were able to overrule the other side? Will fans applaud this move to hold off on a major change and keep the racing relatively pure or complain that NASCAR isn’t doing enough to entertain them? What happened: According to a report by the Reuters wire service, the France family is exploring a sale of NASCAR. Reuters said investment bank Goldman Sachs is working with NASCAR to find a potential buyer. NASCAR declined comment when I asked about this story and I have not been able to confirm it independently — but Reuters is a highly respected outlet and there’s no reason to believe this is a false report. What it means: This is the first development in what could ultimately become one of the most important stories in NASCAR history. That the founding France family is even considering selling the sport and cashing out is a massive development that could have significant repercussions. And if the sale actually happens? NASCAR as we know it is likely to change forever, perhaps undergoing a transformation that could be similar to Formula One’s makeover. F1 was sold two years ago for $4.4 billion to Liberty Media. News value (scale of 1-10): Like an earthquake too large to be accurately measured by a seismograph, this one is off the charts. Depending on what happens and who buys it and what their intentions are, this could turn out to be the biggest NASCAR story ever. Three questions: With the potential of a sale now becoming public, what kind of immediate impact could this have on the sport? What entity has both the interest and billion dollars (at least) it would take to purchase and run the most popular form of racing in America? Would a new owner be able to save NASCAR from its decade-long slump, or would such a change only accelerate the decline? What happened: The Automobile Racing Club of America — better known as ARCA — was purchased by NASCAR in a deal announced Friday morning at Talladega Superspeedway. ARCA will continue to operate under its current structure through this season and all of next year until things get reorganized in 2020. What it means: It’s hard to grasp all the motivations at play here, and I don’t think they’re obvious yet. NASCAR already has the K&N East and West Series, which are somewhat on the same level as ARCA. So what gives? Well, Kevin Harvick said something interesting recently, and it might be telling: “Everybody wants to go run ARCA” to advance their careers after Late Models instead of running K&N. “ARCA runs on more ISC race tracks than the K&N East or West does, so the kids that are coming up through the series want to be on those racetracks,” he said. “That conversation shouldn’t ever be had. It should never be a thought.” Perhaps NASCAR is looking at this purchase as an opportunity to combine ARCA with its K&N Series and address exactly what Harvick was talking about, thus cementing its place as the organization for stock cars on every level (from NASCAR Home Tracks to Cup). News value (scale of 1-10): There are two different values for this one. If you’re just a NASCAR Cup Series fan, this isn’t huge news for you — maybe a 4. The impact most fans would likely notice is around the support races during a Cup weekend. But if you’re a grassroots stock-car racing fan who follows the sport at all levels, this is a big day and might be as high as an 8. Three questions: How will the NASCAR ladder system change in light of this acquisition? Will ARCA still be able to have its own identity, or will it get NASCAR-ized and called something like “K&N Midwest?” Is there any chance some of the short tracks ARCA runs could be a venue for a NASCAR national series race, such as the Trucks?